We go above and beyond to make sure that our clients personal information is always secure and confidential. You can rest assured we will bring you the evidence you need professionally and most importantly legally. No matter if you're a big time CEO of a major company, or just a concerned parent/spouse. CorpsElite has a wide variety of specialty services to meet your immediate need! 1. Tell Us About Your Case. Fill out the contact form below! or give us a call. Everything you tell us about your case is 100% confidential. Consultation is unlimited. 2. Payment. After reviewing your case and custom tailoring a plan of attack for your case! A retainer will be paid and we will began services immediately following payment. 3. Learn the Truth. A CEI investigator will start your case immediately! Collecting photographic and video evidence as well as writing an official report on behalf of that evidence that will be an admissible asset to our clients in a court of law. 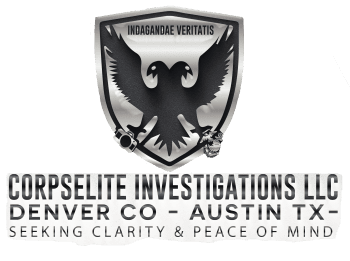 CorpsElite Investigators are comprised of former Marines, as well as Criminology & Criminal Justice Experts! Law Enforcement & Military Police. We pride ourselves in knowing we can accomplish any task or investigation expertly for our clients. Hire the experts! Start Investigation. Fill Out The Form Below. Or utilize the chat bubble on our website and speak with a 24/7 LIVE case manager and ask questions on pricing.